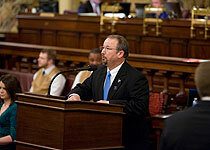 Moul speaks today on the House floor on his resolution to generate greater awareness of Tourette Syndrome. The House today approved House Resolution 236, sponsored by Rep. Dan Moul (R-Adams/Franklin), which designates May 15 to June 15 as Tourette Syndrome Awareness Month. The Tourette Syndrome Association (TSA) of Pennsylvania, which is headquartered in my legislative district, serves more than 9,000 adults and children statewide.